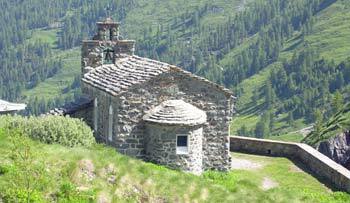 If you scramble up the hill behind the Hotel du Barrage, you'll come across a stone chapel that was built by workers in the 1930s, when the first Dixence dam or ancien barrage (now submerged in the Lac des Dix) was constructed. 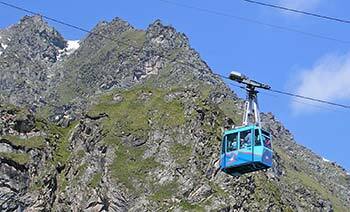 From a station near the hotel, a télépherique or aerial cablecar lifts visitors from the base of Grand-Dixence to the top of the dam's 285-meter wall. 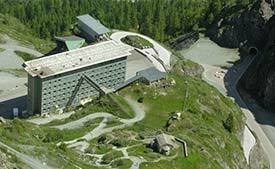 This picture gives an idea of the Grande Dixence Dam's scale. 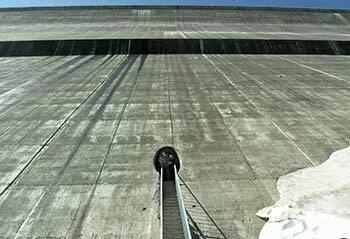 The top of the wall is the skinny part of the dam--it's only 15 meters or about 50 feet thick, compared to a depth of 200 meters or 656 feet at the base. 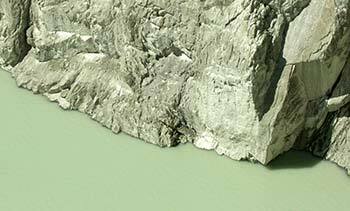 There's enough concrete in the Grande Dixence Dam to build a wall 1.5m or 5 feet high, 10 cm or 4 inches thick, and 40,000 km or nearly 25,000 miles long, which is roughly the earth's circumference at the Equator. 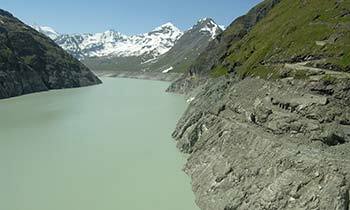 Behind the Grande Dixence Dam, the Lac des Dix extends some 4 km or 2.5 miles into the Val des Dix. 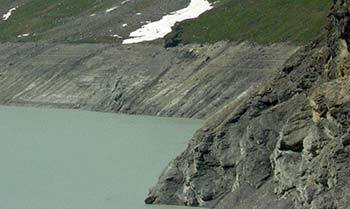 The lake is fed by glaciers and by pumping stations in adjacent valleys, which send water to the Lac des Dix for storage during times of excess generating capacity. The vegetation-free strip on the lake's banks indicates the maximum water depth. 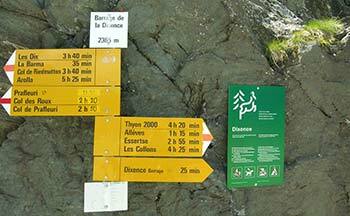 The Lac des Dix reaches its lowest level in spring; in summer, as glaciers melt, the lake fills up. The lake is normally at its deepest in September. The Grande-Dixence Dam's older, smaller predecessor is normally submerged in the lake, but the old dam occasionally becomes visible during times of low water. 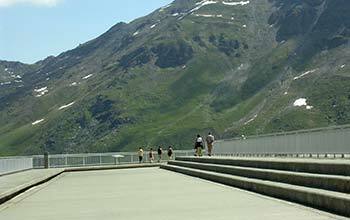 Unlike some hydroelectric dams (such as Hoover Dam in the United States), the Grande-Dixence dam has no power turbines on site. Water is sent to generating plants at lower elevations. If all of the hydroelectric plants downstream were operating at full power and no water was entering the lake, the lake would be drained in about 2,000 hours. If the sight of all that water makes you thirsty, don't dip your canteen into the lake: It's fed by glaciers, and the suspended rock particles in the water will erode your innards. The water is so abrasive that turbine blades in the hydroelectric plants downstream must be replaced every one to two years. 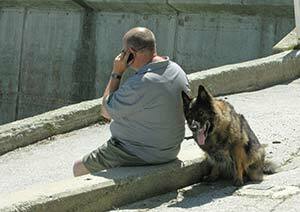 The top of the Grande Dixence Dam may seem remote, but you can use your mobile phone, and about 100,000 people visit every year (some with their dogs). Finally, before heading back down, take a moment to study the architectural plans and diagrams on the wall next to the télépherique station, where you'll also find public toilets. This diagram shows that the Grande Dixence Dam is nearly as high as the Eiffel Tower. The small dam on the right side of the drawing is the ancien barrage or old dam that was built in the 1930s and is now submerged in Lac des Dix.